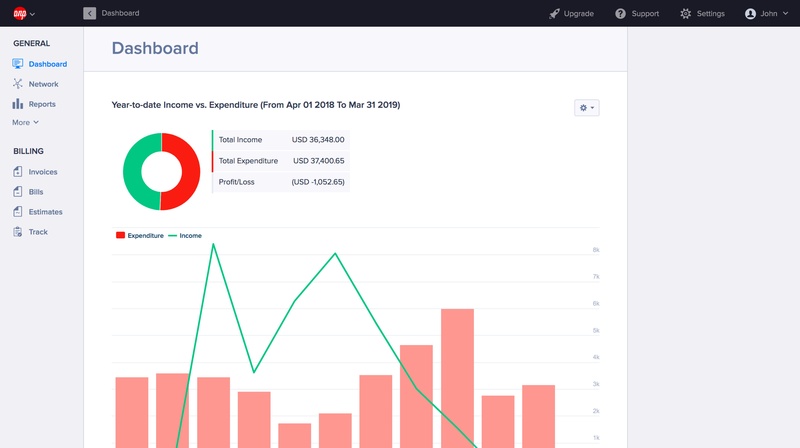 Dashboard Reports provide you at a glance summary of your account. It’s also a great way to quickly see how you’ve been doing over a period of time! At the top of your dashboard, you will find your Activity Stream, which shows all the changes you’ve recently made to your account. Just under this feed, you will find your dashboard reports, grouped by the different currencies you have used for your invoices. This first graph can be toggled to display either Income Over Time or Estimates Over Time via the Settings icon at its top right. The settings dropdown also lets you customise the analysis period and choose a 6 month, 12 month or custom timeframe from which to generate reports. Hover over each bar on the bar chart to read their values. Click on a bar to be taken to a detailed Income / Estimates Over Time breakdown that shows the combined income from all your invoices that are in a Sent, Partial or Paid state. Click the [x] at the top of your Income / Esimates Over Time details sheet to close it. This donut chart shows your Payments received (in green) and Total outstanding (in red) so far in the financial year. Hover over each part of the chart to read their values. Click anywhere on the chart go to a detailed Year-to-date Invoice breakdown, month by month. Click the [x] at the top of your Income Year-to-date Invoice details sheet to close it. This line graph shows the Income (in green) vs Expenditure (in red) in the current financial year. Click anywhere on the chart go to a detailed Year-to-date Income vs Expenditure breakdown, month by month. Click the [x] at the top of your Income Year-to-date Income vs Expenditure details sheet to close it. These lists list show you the biggest outstanding payments your clients have yet to make to you, and the largest outstanding payments you have yet to make to them. Clicking View More under each list will open the entire list of payments.